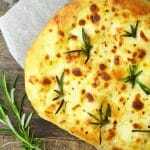 Easy Rosemary Focaccia with mozzarella cheese, it’s light, delicious and so simple to prepare. There’s nothing better than the smell of homemade fresh focaccia bread baking in the oven. I’ve been making homemade focaccia for years now and I love it. 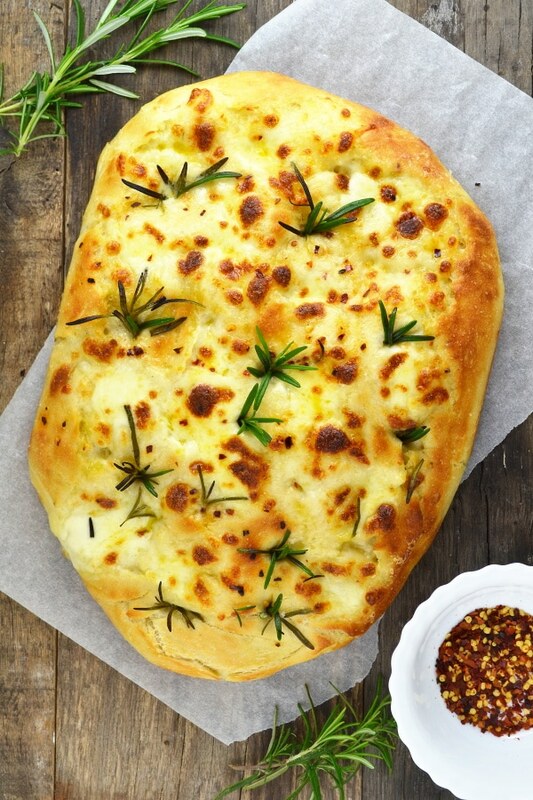 Rosemary focaccia is such a classic and with added oozy mozzarella it’s so delicious. 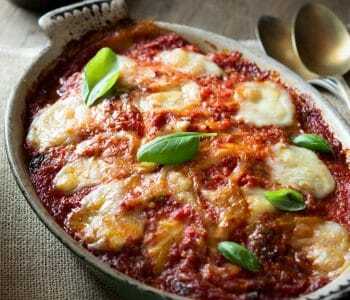 It’s perfect for picnics, lunches, antipasto and of course alongside a big bowl of pasta to mop up the tomato sauce. If you’ve never made your own focaccia before then you really should, it’s not as daunting as you may think and the end results are so rewarding. Once you start making focaccia you can start experimenting with different flavours and toppings such as tomatoes, anchovies, onions, cheese….all sorts of yummy cheeses, olives, the list is endless. 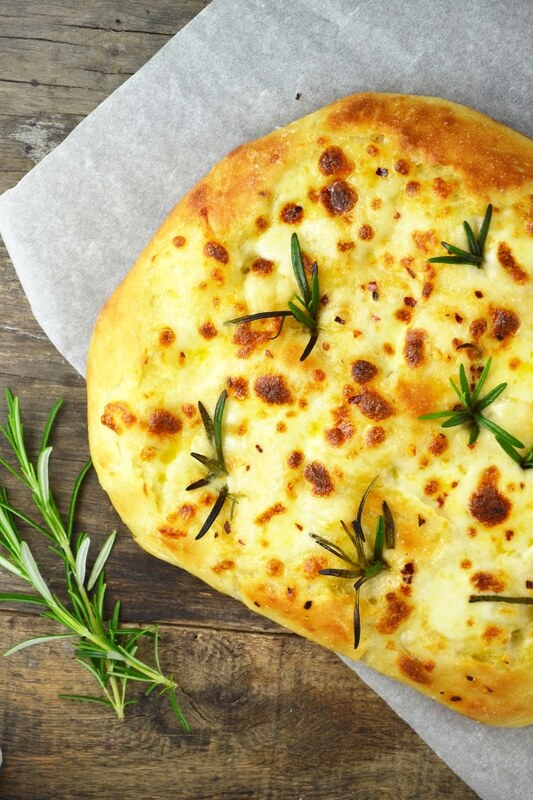 I recommend starting with simple classic flavours like this rosemary focaccia with mozzarella. I often make this when I’m making some sort of pasta at the weekends like this penne with ricotta, pancetta and tomato sauce. My boyfriend, Nathan can literally eat about 3 portions or pasta and still be hungry so having focaccia on hand ensures his belly is full and stops the fridge raid an hour after dinner. It takes under 15 minutes to prepare the dough. First, you add flour to a bowl then add the warm water, yeast, sugar and salt and mix until it starts to come together. Tip it out onto a clean work surface and knead for 10 minutes, you can add an extra dusting of flour if it’s too sticky. Place the dough in a lightly oiled bowl and cover with cling film or a damp tea towel. Let it rise in a warm place for at least 3 hours or until it has doubled in size. At this point, I like to knock back the dough and place it in an oiled baking tray either in a rectangle shape or round/oval if the tray is big enough. I then cover the tray with cling film again and let it rise for another hour. This part is not essential but I’ve noticed the focaccia is much lighter if I have the time to do this step. When I don’t have time however, I just bake the focaccia straight away. I then carefully flatten the dough evenly using the palms of my hands then using two fingers make little dimples in the dough. Cover with a little olive oil and salt then bake in a hot oven for 10 minutes. Remove from the oven, add the mozzarella and insert the rosemary sprigs, bake again for another 10 minutes until the mozzarella has melted and bubbling. 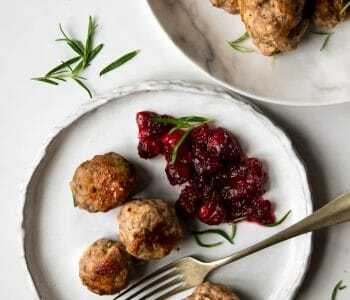 Serve warm as it is or with pasta, enjoy! 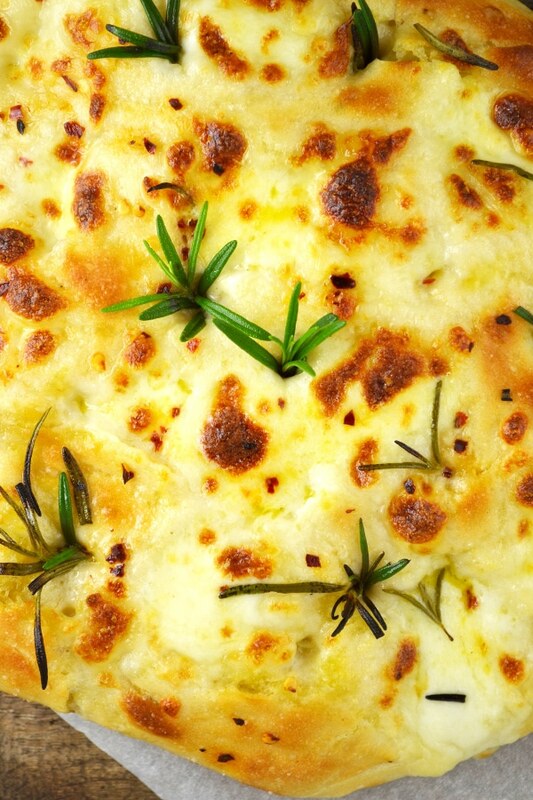 Easy Rosemary Focaccia with mozzarella cheese, it's light, delicious and so simple to prepare. There's nothing better than the smell of homemade fresh focaccia bread baking in the oven. Add the yeast and sugar to the warm water and let dissolve for 5 minutes. Add the flour and 1/2 tsp of salt to a bowl and make a well in the middle. Pour the yeast, sugar, and water into the middle and mix until it starts to form a dough. Lightly dust a clean work surface with flour and knead the dough for 10 minutes. When you lightly press your finger on the dough it should spring back up, that's when you know it's ready. Shape the dough into a ball and add to a large bowl that's lightly oiled in olive oil. Rub the top of the dough very lightly with olive oil and then cover the bowl with clingfilm or a damp tea towel. Store in a warm place for 3 hours or until doubled in size. Preheat the oven to 220°C/425F/gas mark 7. Using two fingers make little dimples all over the surface of the focaccia dough. Drizzle with around 1 tbsp of olive oil and rub all over the surface, sprinkle with salt. Bake in the oven for 10 minutes. Remove from the oven and add the mozzarella, red pepper flakes and insert little springs of rosemary into the dimples, bake for another 10 minutes until the mozzarella has melted and is bubbling. Let it rest for 5-10 minutes then move to a cutting board, cut into squares and serve warm. Time excludes rising time of 3-4 hours. Please note this recipe was developed and tested using metric measurements all imperial measurements are approximate. If I wanted to make this into a breakfast casserole, would I bake it for ten minutes and then add the egg mixture or should I put the egg mixture on the dough like I would a pizza? Hi Nicole, I’ve never made a breakfast casserole before and I’m really not familiar with them so I wouldn’t know the answer, sorry. If you happen to use the recipe then let me know how you get on. So delicious, loved it and very simple.